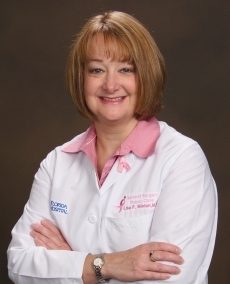 Lisa Minton, MD, is board certified in general surgery with a specialty in breast care. She combines 20 years of clinical expertise and the most current surgical techniques with a passion to help patients return to good health and lead full, active lifestyles. She earned her medical degree at The Ohio State University College of Medicine and completed her residency at Louisiana State University-affiliated hospitals. She is a founding physician of AdventHealth Medical Group’s breast surgery specialty practice in Altamonte Springs. 1. Vitals.com award for most compassionate outstanding physician 2. Manchster's Who's Who 3. Press Ganey Top Performer of the Year 2013, 2014, 2015, 2016, 2017. Dr. Minton offers hidden scar procedures and works with plastic surgeons whenever possible for patients undergoing breast surgery. Patients experience less trauma and have a better outlook when the scarring is minimal. Dr. Minton developed an interest in breast cancer care when both her best friend and her aunt were diagnosed. Since then she has invested the majority of her time in clinical trials and staying up-to-date on cutting-edge technologies to offer her patients the best chance at survival. Note:- The list below is for reference purposes only and is subject to change. Please check with your health plan to confirm that Lisa Minton, MD is included before scheduling an appointment.